Caring for your pool in the winter in the lower mainland is unique from other parts of Canada. Due to our milder winters, we don’t have to take the extreme measures that pool owners in colder climates need to in order to avoid issues related to freezing temperatures. However, there are a few things we encourage you to do to ensure that your pool equipment is protected and to prepare an easy opening in the spring! This will ensure the your pool equipment is protected. Bring a water test in to our store so that we can provide you with instructions to properly balance the pool (pH, Total Alkalinity, Calcium, etc.). If the chlorine level is too high over the winter, you can bleach the liner and unbalanced water can ruin your filter and pump. Make sure all debris is cleaned out of the skimmer baskets and pump trap. Don’t leave a summer cover on your pool over the winter as the weather will ruin it. If you have a variable speed pump, you can keep it circulating a very low rate. This will also protect the pool in the event of a rare freeze. You can also have us pick up your sample for free and we’ll email your test results and deliver your chemicals to you. We will perform all of the regular maintenance that is necessary to prevent damage to your pool and make sure everything is working properly. We will regularly clean your pool, examine the filters and mechanical equipment, and double check the chemical levels. With our weekly pool & spa service, you can lay back and relax, knowing that your pool is taken care of. The anticipation is over. After a long, cold winter, the sun is shining again and you can’t wait to get back into the pool. Here’s some expert advice on preparing your pool for summer. There are three factors to looking after your swimming pool. All three work together to keep it sparkling clean and give it a long, healthy life. Here’s what you need to know. Expert advice from Pool Boss, makers of our high quality pool water treatment products, on keeping your swimming pool water perfectly balanced at all times. 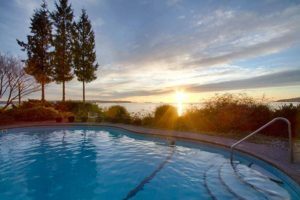 Swim Blue Pools and Hot Tubs has been helping residents throughout Ladner and Tsawwassen make the most of their pools and spas for more than 20 years. From free water tests to installation, pool toys and more, we’ve got you covered. Come by our store and say hello. Connect with us on Facebook. Like our page to get insights on making the most of your pool and hot tub. We’ll keep you informed about special offers, freebies, new products and more. You can unsubscribe instantly at any time. © 2019 Swim Blue Pools & Hot Tubs. All rights reserved.